Decoration 1 initial in colours and gold with foliate penwork decoration and display script (f. 1). Initials in red with penwork decoration in blue, red and/or green, or in blue with penwork decoration in red. Initials in blue or red. Marginal drawings in ink referring to the text (ff. 119, 119v, 122-125, 128v-131). Binding BM/BL in-house. Rebound in 1970. Provenance Added decretal of Celestine III, pope (1191-1198) (ff. 154-155). The cathedral priory of St. Andrew, Rochester: partially erased inscription reading 'Decreta abreviata [de claustro Roffensi per A (?) 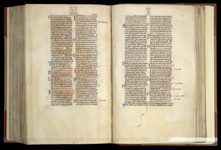 precentorem], 14th century (f. 1) (see Warner and Gilson 1921); included in the Rochester library catalogue of 1202, among the books of Robert, prior of the Rochester cell at Walton St. Felix, or Felixstowe ('Waletune'), no. 236 (see English Benedictine Libraries 1996). The Old Royal Library (the English Royal library): Westminster inventory number 'no. 262' (f. 1), included in the inventory of books in the Upper Library at Westminster of 1542; in the catalogue of 1666, Royal Appendix 71, f. 9; and in the 1698 catalogue of the library of St James's Palace (see [Edward Bernard], Catalogi librorum manuscriptorum Angliae et Hiberniae (Oxford: Sheldonian, '1697', but 1698? ), no. 8376). Notes Includes Omnibonus, Abbreviatio Decreti Gratiani, with glosses (ff. 1-136); decrees of the third Lateran Council of 1179 (ff. 137-139v), and an appendix of decretals; the latest are of the pope Lucius III (1181–1185) (ff. 139v-154). Select bibliography George F. Warner and Julius P. Gilson, Catalogue of Western Manuscripts in the Old Royal and King’s Collections, 4 vols (London: British Museum, 1921), I, pp. 325-26. Stephan Kuttner, Repertorium der Kanonistik, 1140-1234: Prodromus corporis glossarum (Vatican City: Biblioteca Apostolica Vaticana, 1937), p. 259. Medieval Libraries of Great Britain: A List of Surviving Books, ed. by N. R. Ker, 2nd edn, Royal Historical Society Guides and Handbooks, 3 (London: Royal Historical Society, 1964), pp. 163, 296. Katharine Mary Waller, 'The Library, Scriptorium and Community of Rochester Cathedral Priory c. 1080-1150' (unpublished doctoral thesis, University of Liverpool, 1980), p. 361. Rudolf Weigand, 'Die frühen kanonistischen Schulen und die Dekretabbreviatio Omnebenes', Archiv für Katholisches Kirchenrecht, 155 (1986) 72-91 (p. 81). Suzanne Lewis, The Art of Matthew Paris in the Chronica Majora (Aldershot: Scolar Press, 1987), p. 35, fig. 11. Rudolf Weigand, 'Die Dekret-Abbreviatio Omnebenes und ihre Glossen', in Recht als Heilsdienst: Festschrift für Professor Dr. Matthäus Kaiser, ed. by Winfried Schultz (Paderborn: Bonifatius, 1989), pp. 271-87 (pp. 271, 273 and passim). English Benedictine Libraries: The Shorter Catalogues, ed. by R. Sharpe and others, Corpus of British Medieval Library Catalogues, 4 (London: British Library, 1996), B79.236. The Libraries of King Henry VIII, ed. by J. P. Carley, Corpus of British Medieval Library Catalogues, 7 (London: The British Library, 2000), H2.666. Charles Duggan, 'Decretal Collections from Gratian's Decretum to the Compilationes antiquae: The Making of the New Case Law', in The History of Medieval Canon Law in the Classical Period, 1140-1234: From Gratian to the Decretals of Pope Gregory IX, ed. by W. Hartmann and Kenneth Pennington (Washingtonhe Catholic University of America Press, 2008), pp. 246-92 (p. 257, n. 35).